Mk. Vb was the first production version of the Spitfire to use “clipped” wingtips as an option, reducing the wingspan to 32 ft 2 in (9.8 m). The clipped wings increased the roll rate at lower altitudes. A clipped-wing Spitfire Mk. Vb of No. 401 (Canadian) Squadron. Although this aircraft is a Mk. Vb, it features a later type canopy with integral windscreen usually associated with Mk. Vc’s. Several different versions of the Merlin 45/50 family were used, including the Merlin 45M which had a smaller “cropped” supercharger impeller and boost increased to +18 lb. This engine produced 1,585 hp (1,182 kW) at 2,750 ft (838 m), increasing the L.F VB’s maximum rate of climb to 4270 ft/min (21.6 m/sec) at 3850 ft. The tropical version of the Mk Vb could be identified by the large Vokes air filter fitted under the nose. This intake reduced the speed of the airflow to the supercharger, thus decreasing its efficiency and the performance of the aircraft. It was also fitted with desert survival gear behind the pilot’s seat. 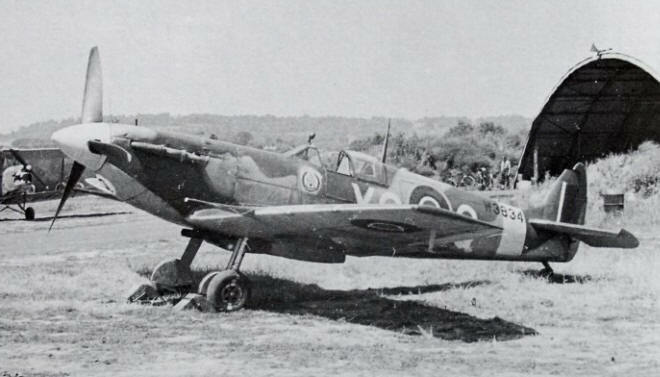 The Vb Trop was the first Spitfire variant to be used in large numbers overseas, playing an important role in wresting air superiority from the Luftwaffe over Malta. Many Vb Trops were modified by RAF Depots in Egypt through replacing the Vokes filter with locally manufactured “Aboukir” filters, which were lighter and more streamlined. The new design also went some way to restoring the speed and “ram effect” of the airflow to the supercharger. Two designs of these filters can be identified in photos: one had a bulky, squared off filter housing while the other was more streamlined. These aircraft were usually fitted with the wide blade Rotol propeller and clipped wings. The Vokes filter located under the nose of tropical Mk. Vs spoiled the graceful lines of the Spitfire in this area and had adverse effect on performance, but its use was a necessity in the Mediterranean theatre of operations. This is a Mk. Vc (Trop), with an external 45-gal slipper tank. As well as having most of the standard Mk V features this version had several important changes over the earlier Mk Vs, most of them modifications which were first used on the Mk III. First and foremost, the Type C “universal” wing was used. Most Vc wings had a large, bulged fairing on top of the wing to provide clearance for the ammunition feed motors of two Hispano cannon in each wing: because two cannon were seldom fitted these fairings were later reduced in size to more streamlined shapes. The initial aim with the “C” wing was increasing the armament to four 20-mm Hispano cannon and indeed, initial production Spitfires Mk. Vc were delivered with this type of armament. Combat experience in the Mediterranean had shown that such heavy armament was impractical, and in time the production standard shifted towards two cannon and four machine guns. The structure was re-stressed and strengthened. Also, the Spitfire Mk. Vc was the first Spitfire able to carry a range of specially designed “slipper” drop tanks which were fitted underneath the wing centre-section. Small hooks were fitted just forward of the inboard flaps; when the tank was released these hooks caught the trailing edge of the tank, swinging it clear of the fuselage. A deeper radiator fairing was fitted under the starboard wing, and a larger oil cooler, with a deeper, kinked air outlet, to port. The Mk. Vc introduced the new windscreen design first seen on the Mk III. Later, a number of Mk. Vbs were also fitted with this type of windscreen. Late in the Mk. Vc production the elevator horn balances were increased in area. This modification followed the identical one carried on the Spitfire Mk. IX then in production to increase the lateral stability of the aircraft. The bulk of the Mark Vc were sent overseas with and were used either in North Africa and the Mediterranean or in the Far East. In total, Mk. V production was 6,487, consisting of 94 Mk Va, built by Supermarine, 3,911 Mk Vb, (776 by Supermarine, 2,995 Castle Bromwich and 140 Westland) and 2,467 Mk Vc, (478 Supermarine, 1,494 Castle Bromwich, 495 Westland) plus 15 PR Type Fs by Castle Bromwich. With the advent of the superb Focke Wulf Fw 190 in August 1941 the Spitfire was, for the first time, truly outclassed hastening the development of the “interim” Mk. IX. 1944-production Spitfires Mk. Vc featured several modification common with the Mk. IX which by then was the main production variant of the aircraft. Among them are the individual exhaust stacks, modified elevators with enlarged horn balances and the “C” wing with smaller, streamlined cannon blisters. At the time that the Mk V was placed in production there were growing fears that the Luftwaffe were about to start mass producing very high flying bombers such as the Junkers Ju 86P, which could fly above the reach of most fighters of the time. It was decided that a new Spitfire variant would be required with improved high altitude performance. For increased thrust at high altitudes it had a four-bladed Rotol propeller of 10 ft 9 in (3.27 m) diameter. 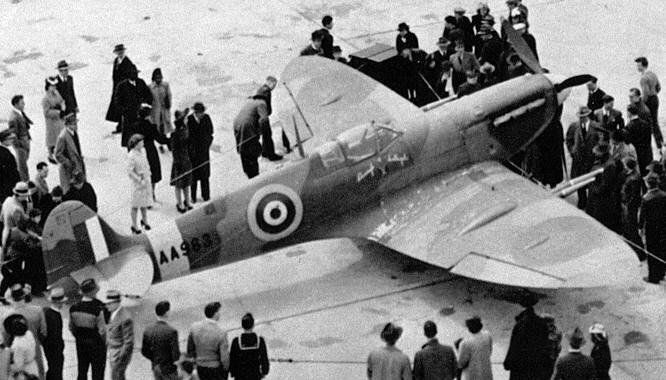 To counter the physiological problems encountered by pilots at high altitudes, it had a pressurised cabin with a pressure differential of only two pounds per square inch. To achieve this the forward and rear cockpit bulkheads were completely enclosed, with all control and electrical cables exiting though special rubber sealing grommets. The side cockpit door was removed and replaced by a continuous fuselage skinning as on the starboard side of the cockpit. The canopy was no longer a sliding unit: externally there were no slide rails. Once the pilot was in, the canopy was locked in place with four toggles and sealed with an inflatable rubber tube. It could be jettisoned by the pilot in an emergency. The windscreen of production Mk VIs was the same as the type fitted to the Mark III and some Mk Vs with the added refinement of a hinged clear-view panel in the port quarter panel. To help smooth out airflow around the wingtips the standard rounded tips were replaced by extended, pointed versions thus increasing the wingspan to 40 ft 2 in (12.2 m). Otherwise the wings were of Type B. 100 of the Mk VIs were built by Supermarine. Only two units, 124 Squadron and 616 Squadron, were fully equipped with this version, although several other units used them in small numbers as a stop-gap. The threat of a sustained high altitude campaign by the Luftwaffe didn’t materialise and, more often than not, the Spitfire VIs were used at lower altitudes where it was outperformed by conventional Spitfires. 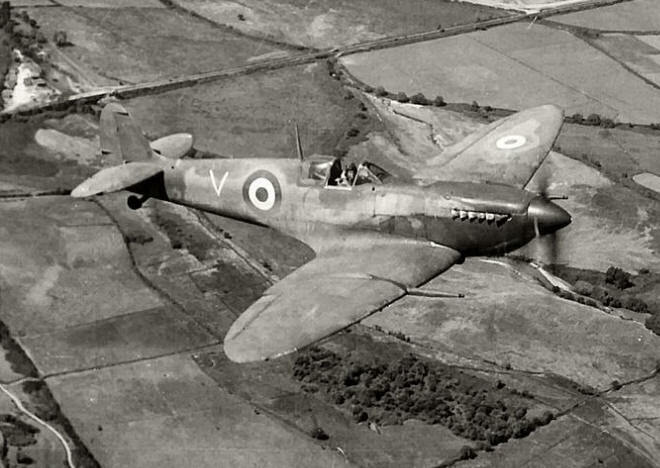 At high altitudes it was discovered that modified Spitfire Vs could perform almost as well as the Mk VI. At low levels, especially, pilots were often forced to fly with the canopy removed because the cockpit would get uncomfortably hot and they weren’t confident it would be possible to jettison the canopy in case of an emergency. The PR Mk. XIII was an improvement on the earlier PR Type G with the same camera system but a new engine, the Merlin 32, which was specially rated for low-altitude flight. It carried a light armament of four .303 Browning machine guns. The first prototype Mk. XIII was tested in March 1943. Twenty six Mk. XIIIs were converted from PR Type G, Mk. IIs or Mk. Vs. They were used for low level reconnaissance in preparation for the Normandy landings. 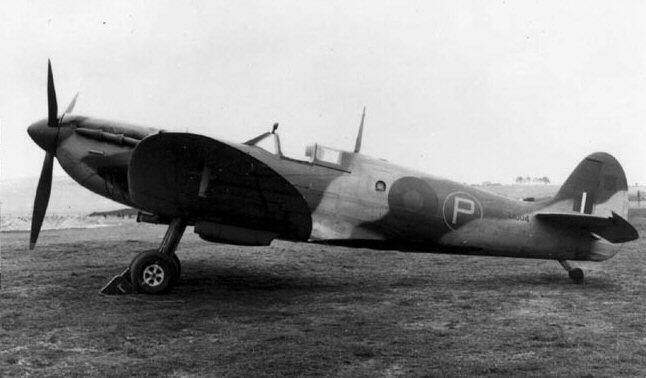 The prototype Spitfire Mk. XIII, featuring two vertical and one oblique camera installed in the area behind the cockpit. In other respects this mark was similar to the Mk. Va.